Prepare pumpkin and potato – peel and cut into one inch (2.5 cm) cubes. Chop onions. Heat oil on low eat in a large pot (6 litre) and add onions. Cook onions until they are soft then add spices. Stir the spices through. *Add pumpkin and potato and stir through. Add water. Simmer for 20 minutes or until vegetables are soft. Check the water level to ensure vegetables remain just covered by water. Blend with hand held stick blender until smooth. The consistency of the soup can be changed by adding more or less water. When serving you may like to swirl a tablespoon of coconut milk over the top of your soup and finish with a heaped tablespoon of fresh herbs. * Step 3 Variation – For additional flavour bake 1/2 of the pumpkin in an oven pre-heated (180 degrees celsius). Allow the pumpkin to brown. Add the baked pumpkin into the pot holding the cooked simmered pumpkin and potato mix. Pumpkin soup is really easy to make and stores well in the refrigerator and freezer. It is a great way to enjoy a favourite Autumn vegetable. It is a colourful, flavoursome meal providing a good source of vitamin A (in the form of beta carotene) and fibre. The spices add flavour and antioxidant benefits. 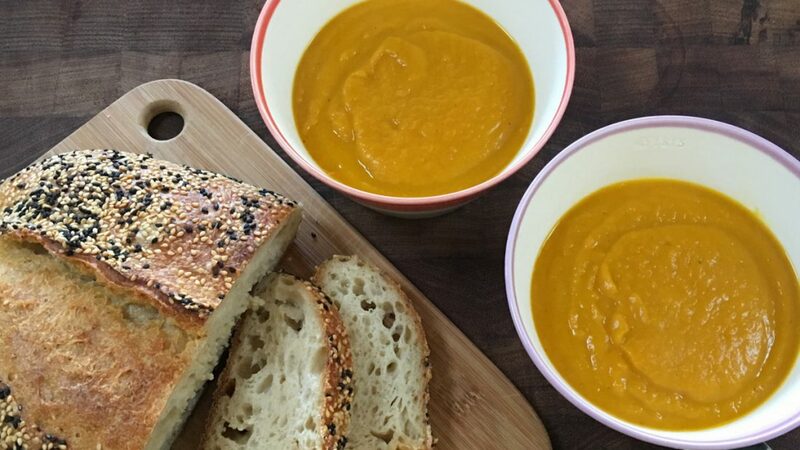 There is nothing quite like a bowl of ginger pumpkin soup to warm you up on a cold day!